Previously I have spoken about prehistoric Australia in great length, namely here and here, and recently wrote an in-depth post about ancient California. Pre-Human Europe however has been something of a neglected subject, despite also being the one I have the greatest interest in. I have mentioned details about it in passing, but now is its time in the limelight. When people think of prehistoric Europe, they typically picture the early Holocene, covered here, but as that post discusses, the pristine European wilderness was already gone by then. No, to see Europe as it would still have looked today if not for our presence, one must go back to the Eemian, also known as the last interglacial. Spanning from 130,000 to 115,000 years ago, it was the last point in time when the climate resembled todays, but the megafauna had not yet died out. 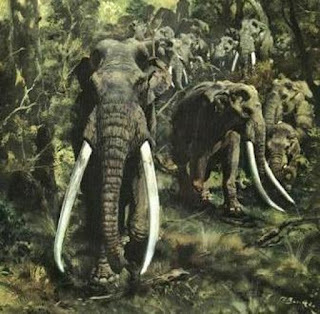 All of the modern species we know today already existed, and at a cursory glance it would have looked quite similar, but the Eemian was to modern Europe what present day southern Africa is to its northern counterpart, an unspoilt, pristine version of the latter, in which the now vanished giants were not just present, but dominated the landscape. In this post I will be covering primarily western Europe, as that is the place with which I am most familiar, and we will explore a Europe quite different from what we know today. To see Eemian Europe would be much like seeing the great nature reserves of Africa, a vast expanse of wilderness, populated by countless animals of all shapes and sizes. The climate was, as mentioned above, similar to that of today, though it fluctuated over the course of the period, but the landscape itself would have been different, at least in the regions covered by ice during the last glacial period. Glaciers shape the landscapes they move across, and countries such as Denmark would have appeared almost entirely different in form, though it is impossible to determine exactly how it looked. 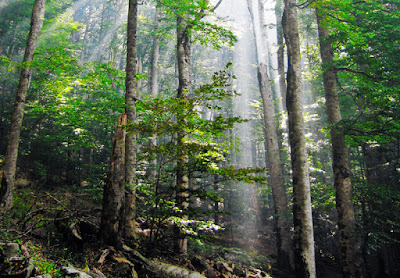 Woodlands covered much of the continent, but were less dense than those of today. 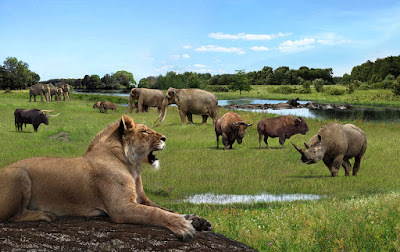 Large grazers and browsers shaped the landscape, creating what I have informally named a "megafaunal savanna", that is, a savanna shaped not by climate or geography, but by the animals living in it. Elephants and rhinos trampled the vegetation and opened up dense stands of bushes and trees, bison and horses grazed the meadows and grasslands, and Aurochs and deer kept the shrubs and smaller trees in check. Due to these factors, many parts of the continent would have heavily resembled places such as the Serengeti or Kruger national park, and studies in Africa have shown that in many regions, when the large animals are removed, the environment undergoes a rapid change in character, grasslands turning to shrub and woodlands growing darker. This is not to say that dense forests did not exist in Eemian Europe. A vast rainforest covered much of the Atlantic seaboard, maintained by the moisture brought in from the sea. Here, colossal trees would have towered above the ground, cloaked in epiphytes such as mosses and vines, while the soil was wet and soft, covered in herbs and bushes. Though similar in climate to the temperate rainforests of the North American western seaboard, it would have been far wetter due to the influence of the Atlantic, giving it a character unlike any other rainforests today. Further inland, other great forests spread across the mountains and wetlands, where large animals had more difficulties reaching, and these would have been similar in nature to the primordial woods still found in places such as Poland and Romania today. 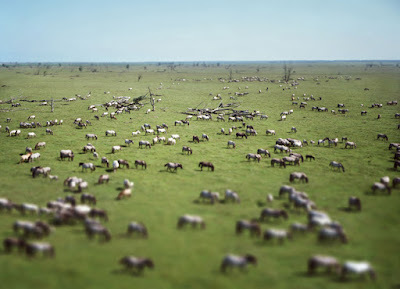 In the floodplains and grasslands, great herds of herbivores would have grazed. Tarpans, the European wild horse, would have been one of the most prevalent animals, forming huge congregations resembling those made by zebras today. Aurochs and Bison would have shared their habitat with another bovid few people know used to live in Europe, the Water buffalo. Bison prefer drier environments, and would presumably have stuck to the savanna and woodlands, while Aurochs were more adaptable, capable of surviving in both dry and wet conditions. The Water buffalo were not the only large mammals inhabiting the waterways of ancient Europe however, and they shared their habitats with Hippopotamus. While typically seen as tropical animals today, this is merely a result of their extermination in the entirety of their temperate range. Large animals do not need as much fur for insulation as smaller ones, and equipped with the huge quantities of fat that they possess, hippos were perfectly capable of surviving even in the colder regions of Europe. When Trafalgar square was first being excavated, the workers found hundreds of Hippopotamus bones, indicating the animal's once great abundance. Deer were common then as they are today, but would have played a different role in their environments. While Roe deer were probably shy forest dwellers, Red deer, typically also thought of as woodland animals, seem to have been common in open environments too. 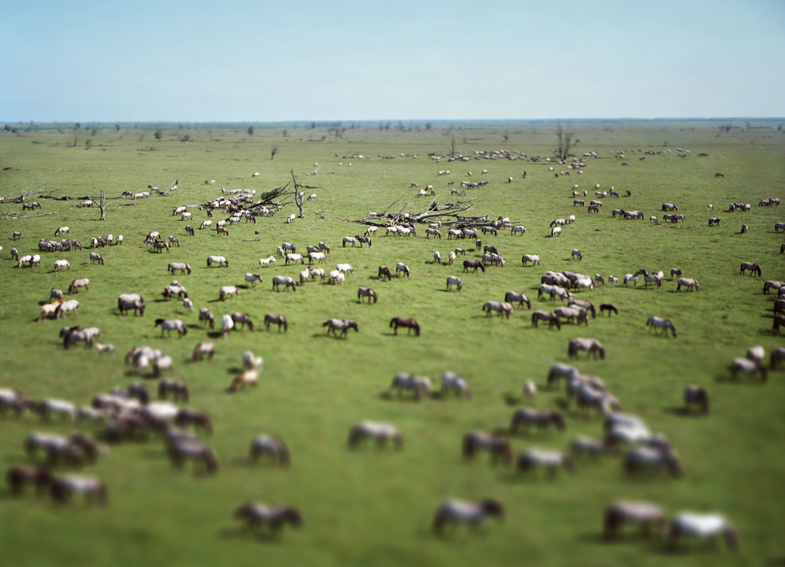 As indicated by places such as Oostvaardersplassen, when given the option, Red deer will often form large herds in the open grasslands and savannas. There were also deer species now extinct, most prominently of the genus Megaloceros, the largest and most well known species being M. giganteus, often but incorrectly called the Irish elk. Larger than the Alaskan moose, they were huge animals, and also seem to have preferred more open environments. Fallow deer are widely known to have been introduced to western Europe by people, but less well known is the fact that they were actually present throughout all of the continent during the last interglacial. In a way, one could almost view their introduction for the purposes of hunting as a form of unintentional reintroduction. Largest of the terrestrial animals in Eemian Europe were the elephants and rhinoceros. 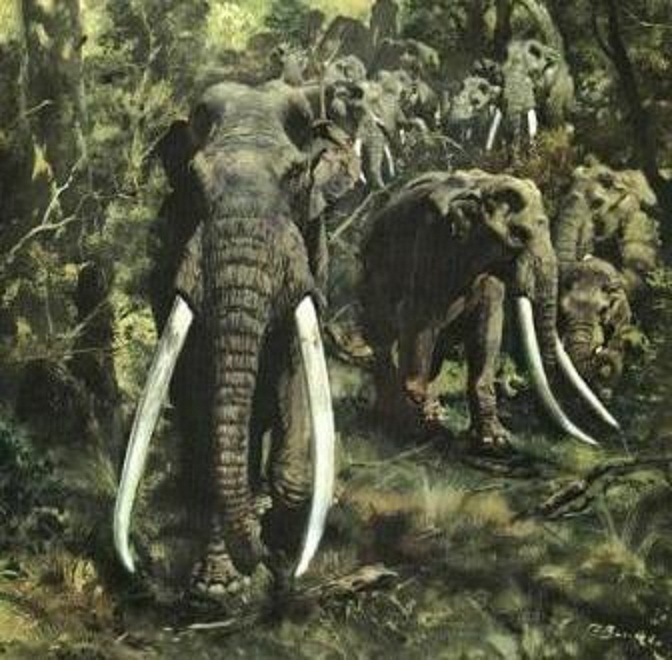 When most people hear "Elephants in Europe", they think of the Woolly mammoth (Mammuthus primigenius), but the mammoth was a cold adapted species, native to the northernmost parts of Eurasia and North America. They only spread into Europe during the last glacial period, as the climate there came to resemble that of Siberia and Alaska, and would have returned north after the end of the glacial period had Humans not wiped them out first. No, the true European elephant was the European elephant, Elephas antiquus, sometimes also called the Straight-tusked elephant. Similar in size and shape to its close relative, the Asian elephant, it had proportionally longer legs, and more impressive tusks, but was otherwise almost identical in looks and ecology. Commonly found in Pleistocene sediments, it was evidently very abundant, clearly one of the most successful animals of its time. As with elephants in Africa and Asia today, the European elephant was what we call an ecosystem engineer - a species that exerts a greater force upon its environment than the environment does upon it. Actively shaping their surroundings by creating temporary wetlands where they walked and slept, and clearing woodland by toppling trees and crushing bushes, the latter action in particular is fascinating, as trees and shrubs in modern day Europe display a heavy resilience to being bent and broken, an adaptation that African and Asian trees also show. On those continents, this seems to be a defense against elephants, and it is almost certain that the adaptations seen in the European trees exist for the same reason, an echo of the past, and a defense against a now gone foe. Again, when most people here "rhinos in Europe", they think of the Woolly rhino (Coelodonta antiquitatis), but as with the Mammoth, these were tundra animals, only moving into Europe temporarily during the glacial periods. The true European rhinos were Merck's rhinoceros and the Narrow-nosed rhinoceros. One was a specialized browser, the other a grazer, resembling the extant White and Black rhinoceroses in ecology respectively. Members of the genus Stephanorhinus, they arrived during the mid Pleistocene and remained there until 40,000 years ago, when Humans hunted them to extinction. During the Eemian, both were widespread, present from Britain to eastern Europe and beyond. As with the elephants, the remains of rhinoceros are common, indicating that the animals were highly abundant. Both were similar in size and appearance to the African rhinos of today, but were in fact more closely related to the various critically endangered species found in Indonesia today. This brings us to the predators. Eemian Europe was home to an impressive predatory guild, even greater than that of Africa today. Chief among these were the Lions, covered previously, which played much the same role then as they do today where they persist. Slightly larger than modern Lions, they belonged to the same species, and were probably almost completely identical in ecology. They may have shared the roles of top predator with the Scimitar cat (Homotherium), though this species has an odd history in Europe. Abundant until 500,000 years ago, when it suddenly disappeared, recently discovered remains from the North Sea show that it was present in Europe 28,000 years ago. Whether this indicates that the genus was present continuously in Europe all along, but that we merely have not found remains, or that they periodically returned to the continent before going extinct again is unknown. Whatever the case, it can be said with relative confidence that Homotherium may very well have been present in Europe at least briefly during the Eemian, though it is not certain. Other than the Lion and possibly Homotherium, Europe was also home to two other big cats, the Leopard and the Lynx. For more on them, read the article linked above. Cats were not however the only predators in Europe, nor did they make up the bulk of the predator guild. Canids in particular were highly diverse during the Eemian, represented by the Grey wolf, Red fox, Golden jackal, and Dhole. 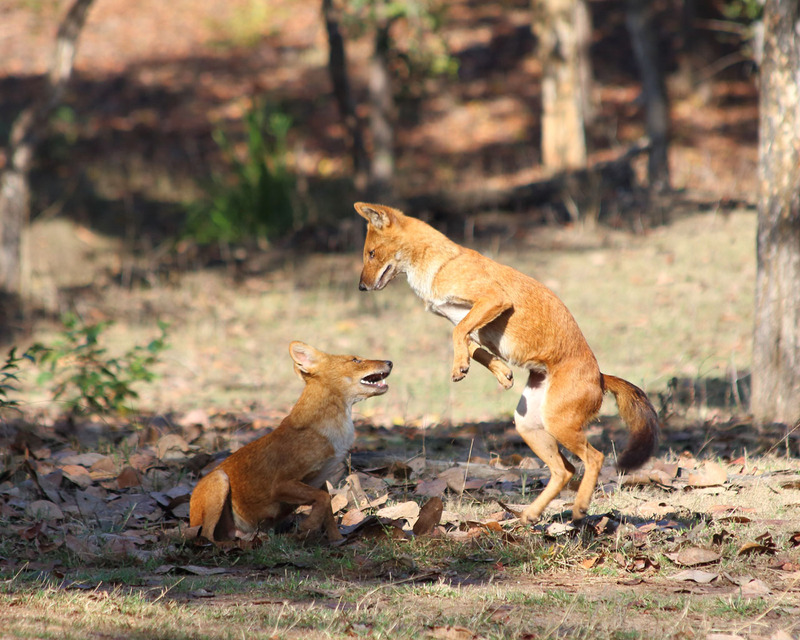 Canids, evidently being a very resilient group, experienced only one extinction, the Dhole. It has survived til today in southeast Asia, but is now highly endangered, and a reintroduction scheme may be the only way to save it from extinction. Another apex predator was the Spotted hyena, widely distributed across most of Eurasia all the way up until the beginning of the Holocene. While hyenas widely disliked by the general public, they are impressive animals, adaptable and in many cases better and more efficient hunters than Lions, far from "mere" scavengers, and their presence in Europe attests to this. Lastly in the predator guild are the bears, represented by two species, the extant Brown bear, and the extinct Great bear (Ursus spelaeus), typically referred to as the "Cave bear". Counting all these species together, one can see that Eemian Europe clearly housed a predator guild every bit as diverse as that of Africa, and highly impressive in its own right. While Europe today is certainly not the richest continent in terms of wildlife, it harbors the memories of a time when it once was. It is crucial to note that while what I have been describing in this post is the Eemian of Europe, almost every single thing said would also apply to a present day Europe where modern Humans had never arrived. Of the species I have listed here, many are extinct, but the blame for each and every one of these extinctions lies solely on us. As the world's remaining wildlife withers and dies in the poor countries where it previously had refuge, it is no longer acceptable for us to sit and watch without taking any considerable action. Nature in Europe has already been reduced to tattered remnants, but just as the present is not the past, nor must it be the future. Wildlife needs a new refuge, somewhere capable of affording its presence, and defending its inhabitants. The future of European conservation is restoration, and in the process of bringing back our own nature, we also have a chance to save the wildlife currently vanishing from the rest of the world.